You can eliminate most skin parasites by using topical flea and tick medications and monthly heartworm preventive tablets. The latter also gets rid of ear mites. The best way to know if your dog has skin parasites is by brushing him regularly and checking for any signs of infestation or lumps and bumps. If he starts scratching or you notice skin irritation, inspect him closely. Your veterinarian can recommend medications to keep parasites at bay. If he's scratching, check for skin parasites. Perhaps the most common of skin parasites, fleas and ticks are also the most easily eradicated by the use of monthly topical or oral medications. If your dog is scratching, fleas could be the culprit. That's also the case if he suffers from hot spots or hair loss caused by flea allergies. Use a fine-toothed flea comb on your pet to uncover flea presence. Even if you don't find any of these tiny biting insects on the comb, small black specks of "flea dirt" -- actually flea feces -- gives them away. Check your dog for bloodsucking ticks after every outing if he's not on a tick control medication. A tick bite can transmit Lyme and other diseases. Canine mange falls into two categories: sarcoptic mange and demodectic mange. The former, caused by the mite Sarcoptes scabe, causes fierce itching, hair loss and crusty scabs -- and it's transmissible to people. Your vet might prescribe antibiotics if your dog has secondary skin infections, along with special shampoos or dips to kill the parasites. Because sarcoptic mange spreads easily, you must treat every dog in the house, even if the other dogs have no symptoms. Most dogs have a few Demodex canis mange mites on them, to no ill effect. Serious cases of demodectic mange result in itching, sores, hair loss and a foul smell and affects large areas of the body. Even with shampoos and medications, it can take a long time to eradicate demodectic mange. You might not be able to see canine ear mites, but you'll certainly notice the damage they cause your pet. 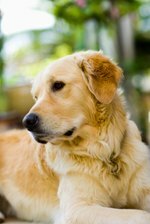 Dogs with ear mite infestation usually have red, scabby, crusty ears. If your dog has ear mites, he'll shake his head constantly and scratch his ears. Your vet can prescribe a miticide to treat your dog and any other canines or felines in the household, since ear mites are quite contagious. Formally known as canine pediculosis, dogs infested with lice are tormented by these bloodsucking or skin-chewing parasites. Symptoms of lice infestation include scratching, poor coat quality and hair loss. Severe lice infestations can cause anemia, especially in puppies. You can spot the flat, wingless six-legged lice on your dog, or see the tiny white eggs -- or nits -- on hair shafts. Your veterinarian can prescribe special shampoos to rid your dog of lice, along with medication that also takes care of any fleas or ticks. Purchase new bedding for your dog or wash his old bedding in bleach to prevent reinfestation. Cuterebra infestation, colloquially known as warbles, is one of the more disgusting types of skin parasites. It occurs when a botfly maggot enters the dog's body through one of its orifices, traveling throughout the body and eventually forming a skin lump. While a lump forms under the skin where the maggot grows, a dog might show other symptoms of cuterebra infection. These include coughing, breathing difficulties, circling, vision loss and paralysis. Unless there's an obvious lump, cuterebra isn't likely to be the first diagnosis that springs to your vet's mind. Your vet can remove the maggot from the skin -- don't try it at home if you notice the maggot emerging. Your dog's prognosis depends on whether there is larval damage in other parts of the body.